Do you approach everything with an upbeat, go-getter attitude? 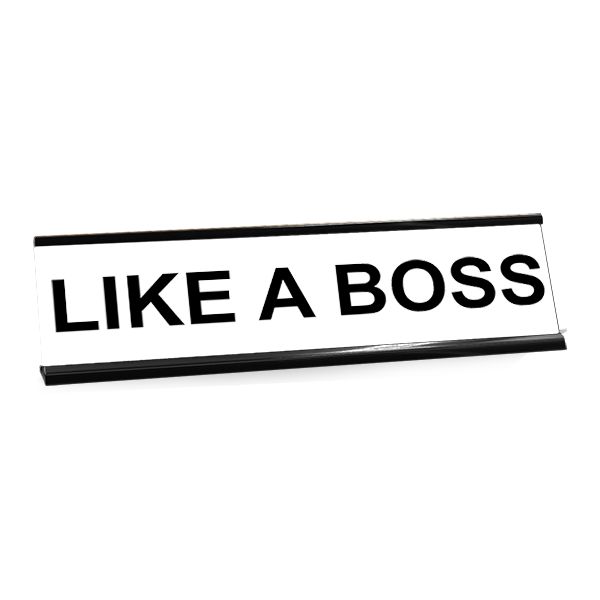 Make certain that your work space looks the part with the support of this Like A Boss desk plate! Ideal for any cubical, get yours now! Few things say says status quite like a top notch engraved name plate! Ideal for just about any company atmosphere, our Desk Plates are custom made to your needs and are readily available in a range of designs for your choosing. These particular custom desk plates are supposed to be cheeky and feature tongue and cheek titles excellent for any job at your company. Each of these name plates are engraved on plastic and have been made in Florida. Sure to continue on for years, our custom desk plates will add just the precise degree of lightheartedness to any desk. Get your new desk plate today!